My blog came up in some web searches people did for "Powerball poems" after I posted my little found poem about Powerball the other day. If only all my poems were about such heavily searched-for topics. I received another fun bit of comment-spam the other day, so here's another poem built from spam. So anyway, to bring this full-circle: if you win Powerball, pay all the attention to brand-name fashion that you want! Here's another tiny found poem, this one inspired by a quote from "Debbie Baker... 60-year-old retired construction worker" published in the Boston Globe. I do it for fun. to be, it will be. Jackpot! The spam filter for blog comments catches a lot of garbled, mostly uninteresting stuff about various prescription medications, but now and then, something more unique comes through. I turned one long comment into the little poem above. Though I'd hoped to write at least a tiny poem every day in November, I haven't done that! But I've definitely done some poetry-writing this month, which isn't the case every month. Today Liza Minnelli was in the trending news on Google. I clicked on a story from the Washington Post and found some text for a tiny poem. I was looking through some old photos from my collection and found one I don't remember seeing before. This is a family friend, Jane Reed. She grew up with my grandpa and was another grandma to me. I love the combo of her perfect outfit and the employment agency sign. 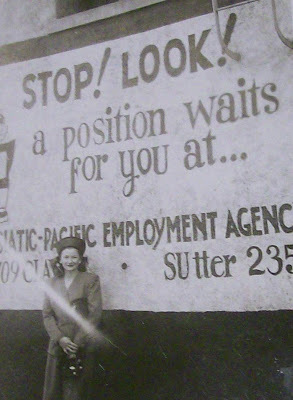 I have to imagine that she was going for a job interview or heading to work when she cleverly decided to have this snapshot taken, but who knows? I would guess that this was taken around 1940. I may have to use a copy of this photo in a collage piece somehow. It really made me smile to find it. Today I had my first-ever Etsy sale, for a copy of Small Is Beautiful. It was pretty exciting to get the sale notification email, even to just sell one tiny zine. I'm new to selling on Etsy, so it may be that everybody else already knows about the two links below, but I found out about both of them this week and thought I'd share them as a way to offer a couple of tips for new Etsy sellers. There's an Etsy community on reddit, where you can post two "shameless plugs" about your own products a day. You can also ask questions and have discussions with other Etsy users. It's fun to see what products people are sharing and give "up votes" to the stuff you like. I also learned about a site called Etsy on Sale which has tools to manage promotions for your Etsy shop--they give the option to put just one category of items in your shop on sale, rather than the shop-wide promotion you can do through Etsy itself. People can also see your items on the Etsy on Sale site, so it gives you a little more exposure. I happened upon both of these links reading the "Business Topics" in the Etsy forums. Hopefully, more browsing and searching the forums will lead to other useful links. Are there any links that have helped you with buying and selling on Etsy? I loved and still love you. After many hours of commenting on essay drafts, I took a break last night and worked on some collage while Trish worked on some knitting. All this with The Simpsons on TV in the background, so you might say that all is right with the world. The text and central image are from old comic books, and the background is from magazine paper. I've been following the November poem a day challenge at Robert Lee Brewer's blog, Poetic Asides. I have some friends who are doing National Novel Writing Month, but I don't know anyone personally who is doing this poetry challenge (unless some of my friends are holding out on telling me! ), so I've been searching with the #novpad hashtag on Twitter to see how some poets I've never met before are faring in their attempts to write a poem each day this month. So far, the poem I like best of the four I've been working on for the first four days of November is the poem from the prompt on November 1 to write a "matches" poem. In my brainstorming, I got to thinking about The Match Game, and here's the poem I wrote. celebrities had written in permanent ink. 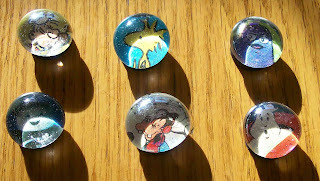 Here are some samples of the magnets I've been making. I probably sold 20 of them at the Short Run small press fest today, but I need a better display for them. Right now I display them on a couple of vintage metal cans. I need like a metal sheet or something. Anyway, it's hard to get a good photo of them since they are so tiny and because of how the glass marbles reflect light, but so it goes. 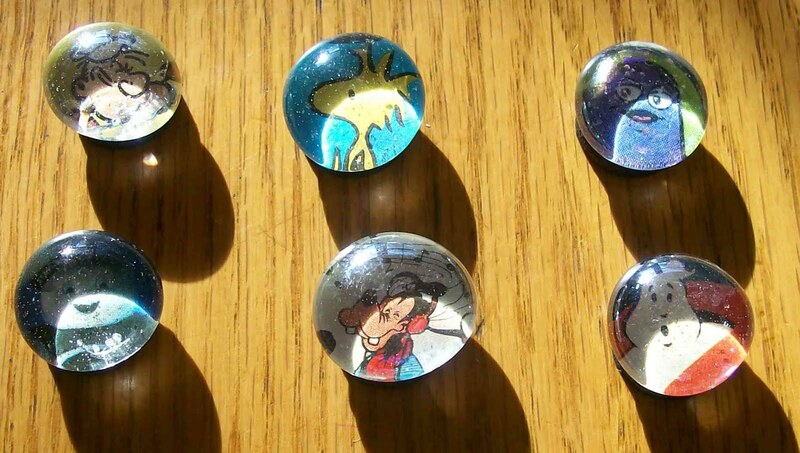 If you want to make your own magnets, here's a good magnet-making tutorial. The author of the tutorial uses a special silicone glue, but I've always used Elmer's white glue, and it works well. Glue sticks don't work well for this project, by the way. Also, the author doesn't use cardstock backings for her magnets, but I highly recommend using cardstock as I think you get a clearer, smoother image (and the black magnet doesn't show through the sometimes thin magazine paper). I often use stickers instead of magazine paper for these, and stickers work GREAT--this gives you the perfect excuse to buy cool stickers. 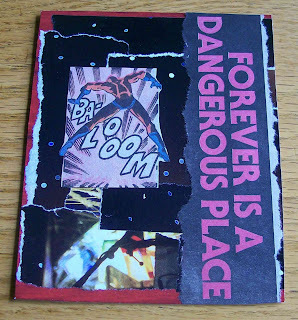 I use images from my collection of old magazines and comic books for these, too. Here's a found poem about the top ten images downloaded over the last week from the photography site, Shutterstock. If you have a suggestion for any websites for me to look at for inspiration for writing more of these little poems based on trending news, searches, downloads, etc, please let me know. I think it's more fun to vary the sites rather than just use the trending searches on Google. Here's my fourth poem inspired by trending searches/news/topics online, this one via Yahoo's "Buzz Index." By the way, if you want to buy Zsa Zsa's house, you can get it for just under 15 million bucks. Yikes. in a film about Iran.